The Tatula CT features a new, compact design that still delivers the same level of performance expected in the Tatula series. The Tatula CT features the ever popular T-Wing System (TWS) which allows casting ease and minimal backlashing even with lighter lures, giving a broader range of lure selection to match any conditions. 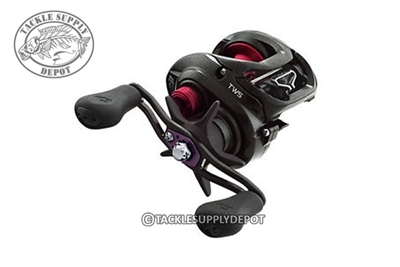 The wide top section of the T-Wing allows line to effortless flow during the cast and once the reel is engaged for the retrieve the line funnels into the narrow lower channel of the T-wing providing even distribution across the spool width. The Ultimate Tournament Drag offers a smooth 13.2lbs of drag and the 90mm handle has been outfitted with over-size grips perfect for increased cranking power. Designed with a durable aluminum frame the Tatula CT features cutting edge technology and demanded reliability that comes in at a total weight of approximately 7.4 ounces and gear ratios ranging from 5.5:1, 6.3:1 and 7.3:1 to a blazing 8.1:1. The Tatula CT has been uncaged and is ready to dominate the waters.